Bizarre looking, exotic creatures from the depths of the ocean, angler fish make a truly remarkable addition to the home marine aquarium. Unlike most deep sea species they can survive and even thrive at low pressures, but to care for them properly you will need to understand their special requirements and unusual feeding habits. Most angler fish sold in the aquarium trade grow to less than a foot in length, so they don't need very large aquaria, but because they can only be kept with fish larger than they are you will need plenty of room if you want to keep one in a community. They are solitary predators and should not be kept with others of their own kind. Angler fish need plenty of live rock in order to get the balance of nutrients required to keep them healthy. In the wild they hide to ambush prey, so they are happiest in environments where there are gaps in the rock where they can hide. If you provide them with a sandy substrate they will often partially bury themselves in it. It's important to maintain a high standard of water quality to keep angler fish healthy. Their burrowing habits often lead to skin abrasions, so you will need to watch out for opportunistic infections and have medicine at the ready if they don't heal within a couple of days. Angler fish get their name from the elongated front ray of the dorsal fin, which forms a sort of fishing line with a lure on the end, dangling in front of the mouth. This lure looks like a small fish or other tasty piece of food, and even glows in the dark to tempt hungry fish and invertebrates after lights out. Needless to say, those investigating it are likely to get eaten. For the most part, angler fish get all their food by luring it in this way, or by waiting for it to get close enough to pounce on. They will eat any small fish and it's good for them to also have access to crustaceans as the extra calcium in exoskeletons helps to keep their teeth strong. Be warned - their semicircular mouths, as wide as they are, mean they can even swallow fish their own size. They will usually ignore larger fish unless they feel threatened. Despite this preference for live food, most angler fish can be persuaded to take chunks of cooked meat or fish after they have grown used to aquarium life. You can make the food more tempting by making it wiggle about in front of them, but use a stick to push it - don't risk your fingers! All the angler fish you will encounter in the aquarium trade are female. This is because the males are parasitic, just a few millimetres long. Occasionally a wild-caught angler fish will arrive with a male attached. The male lives off the female's blood supply, remaining permanently connected to her body and, in return, fertilising her eggs. 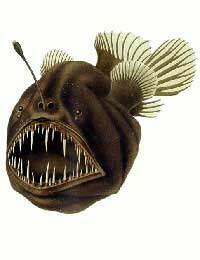 Angler fish have been bred in captivity but need a very large aquarium for this to happen. Their eggs resemble frog spawn, hanging near the surface in large gelatinous sheets, and other fish generally find them delicious to snack on if they get the chance. The young, when they hatch, are tiny, and will stay near the surface, safe from their bottom-dwelling mothers, for several months. Coloured angler fish - despite their deep sea home, these fish come in an extraordinary variety of colours: red, orange, yellow, green or black. What's more, they can change colour every few weeks, generally trying to blend in with their environment. Keep them alongside bright corals to make the most of this. Warty angler fish - with exotic markings, lumpy protrusions and longer than usual lures, these are among the most dramatic looking angler fish. They need a spacious environment. If they have enough hiding places to feel secure they will move about more and you'll see more of them. Striated angler fish - striped bodies and spotted fins make these among the most beautiful angler fish available, and they can change colour in just minutes to better mimic their surroundings. They are also conveniently small, rarely growing to more than nine inches in length. They prefer a multi-level aquarium environment. Angler fish require lots of care and attention but make fascinating, highly rewarding pets.